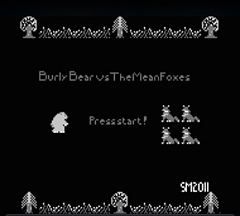 I wanted to see if I could make a little game for the Gameboy, and this was the outcome. Here we have Burly Bear going around swiping at mean foxes, eating cookies, and moving from place to place once the foxes have been felled. 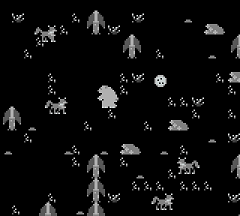 - source code (Windows) - good starting point for your Gameboy development. Works with the Windows version of GBDK. - source code (Linux) - good starting point for your Gameboy development. Works with the Linux version of GBDK. I used the gbdk devkit, which is based on the lcc compiler. And man, is it buggy. Sometimes it will just crash, report an uninformative fatal error, and die. Other times, it will report an error during compilation, and if run a couple more times, it will eventually compile successfully. And other times, after a successful compilation, the rom crashes, or exhibits weird behaviour, such as artifacted sprites, most likely because of misaligned memory. All this nastiness aside, it turned out pretty cool. I didn't add time limits, and the foxes cannot fight back. The cookies will make Burly increasingly faster, for a limited amount of time. I've included all the tools I used, including the devkit, full source code, Excel sheet tilemaker(calculates hex values for tiles, which can then be pasted right into code), and compiled rom. Though it may be easy to find, I've included the emulator with which I tested the game. Take them and make your own game. The sound system on the Gameboy is cryptic. It's based around writing byte values to registers, and is not friendly at all. Take a look at the included sound spec document. If you start your own project based on this and get stuck, email me if you have any questions on the source code included here, and I will try to help! Good luck and send me your creations! 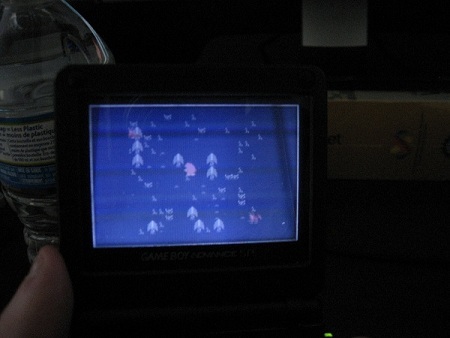 Here's the game running inside a Gameboy emulator, on a Gameboy Advance, via a flash cartridge.